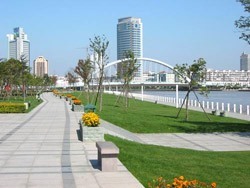 Located in the south of the fertile yangtze delta, ningbo is a city of affluence. the city has a long history dating back to 4800 b.c. ningbo became a major port in the tang dynasty. it began to flourish in the 7th and 8th centuries as a trading port when many portuguese traders started to migrate here . over the years, ningbo has developed into a key port for china&apos;s foreign trade. it also served as a center of culture and religion in the area. ningbo offers visitors many temples and buddhist monasteries including putuoshan island, baoguo si and tiantong temple. Ningbo is in the subtropical monsoon zone with mild weather condition. the city has neither frozenly cold winter nor extremely hot summer. however, summer is humid with a lot of rains. june and september are the two rainy months. ningbo occasionally hit by typhoon in september. Trains: Ningbo railway station, commonly known as the south railway station is at the nanzhan xi lu. the ticket building is in the east of the station. trains to shanghai, hangzhou are very frequent. Bus: While ningbo has two bus stations, the south bus station to the west of the railway station filed almost all the long-distance buses. there buses to shanghai, hangzhou and wenzhou. Local Transportation: For most visitors, the most useful routes are those which connect the bus and train stations with the ferry terminal. Taxi: The flagdwon price is 8 yuan for the first 4 kilometers and 1.5 yuan per additional km. from 22:00 pm to 6:00 am, the starting price increase to 8.8 yuan for the first 4 kilometers. Ningbo has many star-grade hotels to provide a comfortable stay. standing side by side with those up-market lodgings are these street guesthouses and hotel inns which may provide accommodations for really cheap price. after all, there is a hotel to meet your need when you are traveling ningbo. located at the city&apos;s commercial area, this is one of the best hotels in the city. Ningbo is famous for its seafood. braising, roasting and stewing are the three main cooking methods. the dishes are usually tender, fresh and tasty. Click Ningbo Food and Restaurants for more details. Tianyige Museum: The tianyige museum was built around the famous tianyige library, the oldest private library in china. the library houese a large collection of more than 300,000 ancient books. Mountain Putuoshan: Located in the zhoushan islands, mountain putuoshan is one of china&apos;s four sacred buddhist mountains, particularly oriented toward the buddhist deity guanyin, the goddess of mercy and compassion. Baoguo Temple: It is the oldest and best preserved ming dynasty wooden building in south china. other sights in ningbo include the moon lake, chenghuangmiao temple, a catholic church at jiangbei. Read Ningbo Top Attractions for more.